Adikavi Nannaya University conducts AKNUCET every year for PG (M.A., M.Com., M.Sc., M.Ed., M.P.Ed) various courses admission 2019. The AKNUCET (NANNAYACET) 2019 exam will take place on May 07, 2019. Adikavi Nannaya University offers the following PG courses Subject wise M.A, M.Com, M.S.W, M.P.Ed, M.L.I.Sc , M.Sc, M.E/ M.Tech, M.Pharm Admissions Conduct through AKNUCET 2019. NANNAYACET 2019 (Adikavi Nannaya University PG Entrance Test) - NANNAYA PGCET: NANNAYACET 2019 Online Application form details. 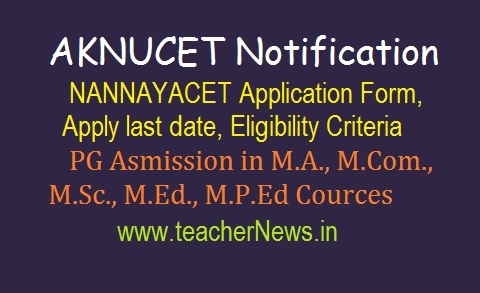 Nannayacet 2019, aknucet 2019, aknu pg entrance test 2019, How to apply, Last date for apply, Online application form, Entrance exam dates, Hall tickets, Results, Adikavi nannaya university pgcet 2019 more details given below. 1. Directorate of Admissions, Adikavi Nannaya University, Rajamahendravaram (erstwhile Rajahmundry) invites applications from eligible candidates for admission through Adikavi Nannaya University Common Entrance Test (NANNAYA CET-2019) into various Science and Arts Courses offered at Campus Colleges of Adikavi Nannaya University (AKNU), Post Graduate Centers at Kakinada & Tadepalligudem and Colleges affiliated to AKNU offering P.G. Courses in East and West Godavari Districts for the Academic year 2019-2020. 2. Candidates who have already passed their qualifying degree examination or who have appeared / are appearing for the final examination in 2019 only are eligible for NANNAYACET-2019. Candidates qualified in advanced supplementary examinations of 2019 are also eligible. Go to Select AKNUCET-2019 link. Select to online registration Tab. Application Save and take print application form for future reference. e) Caste in case of SC/ST/BC/EBC candidates. 01-SRIKAKULAM 02-VISAKHAPATNAM 03-AMALAPURAM 04-KAKINADA 05-RAJAMAHENDRAVARAM 06-RAMAPACHODAVARAM 07-ELURU 08-BHIMAVARAM 09-JANGAREDDY GUDEM 10-TADEPALLIGUDEM. List of following original certificates and verification. (i) NANNAYACET-2019 Rank Card & HallTicket. (ii) Degree / Provisional Pass Certificate. (vi) Date of Birth Certificate (SSC/Matriculation or equivalent Certificate). (ix) Integrated Community Certificate issued by the competent authority in case of SC/ST/BC/EBC/ Minority candidates. (x) Valid latest income certificate issued by M.R.O./ Thasildar if fee concession is claimed ( validity six months ). (xi) 4 recent passport size Photos. (xii) Candidates opting for admission under NCC/Sports/CAP/PH/NSS quota shall produce relevant original certificate, in addition to the above. (xiii) Discharge certificate and service certificate of the parent in case of a child of armed person. (xiv) Physical fitness certificate from an Asst. Civil Surgeon. NANNAYACET PG Admission Notification 2019, Application Form, Exam Date, Eligibility Criteria for PG Admissions M.A, M.Com, M.Sc Adikavi Nannaya University www.aknudoa.in.